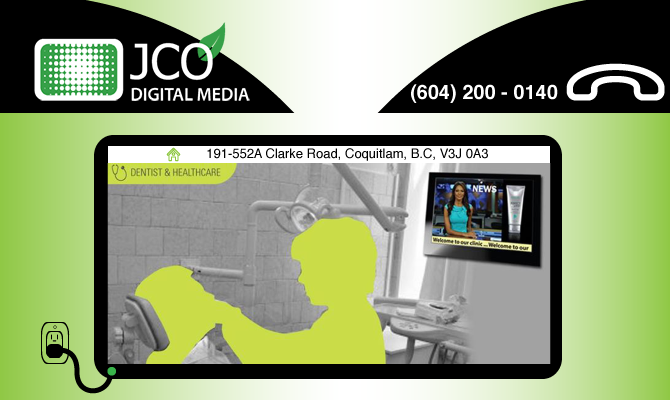 JCO Digital Media is a Canadian digital signage company (under the umbrella of JCO Products Ltd. since 2010) offering green, affordable and attractive signage solutions in the form of commercial media players and displays, graphic and digital media design and website creation for our Canadian and USA customers. This growing form of communication will create more revenue and reduce your costs. Whether you are looking to inform, educate, promote or entertain clients or patients in your waiting rooms, or entice patrons with mouth-watering digital menu boards, we are committed to helping you implement the most effective digital marketing system. No matter if you have a small coffee shop, a fast-food restaurant chain or a number of pubs or liquor stores. Maybe you have a few hotels or schools located in different areas.. it doesn’t matter. We offer commercial-grade displays and media players to manage your content remotely. No matter where you or your displays or TVs are located, the content can reside in the “clouds” , in your servers or reside in the media players also know as controllers or computers (SaaS; software as a service). The option is yours. Our in-house graphic design team can even create the perfect customized content (shareable between your website and mobile) that is attractive, dynamic and impactful. So, if you are dentists, an orthodontics, a doctor, a veterinarian, a nursing home manager, a bar owner, an insurance provider or alike you; please give as a call today and join our mailing list, Facebook, Twitter and Youtube as we share valuable content and offers from time to time.